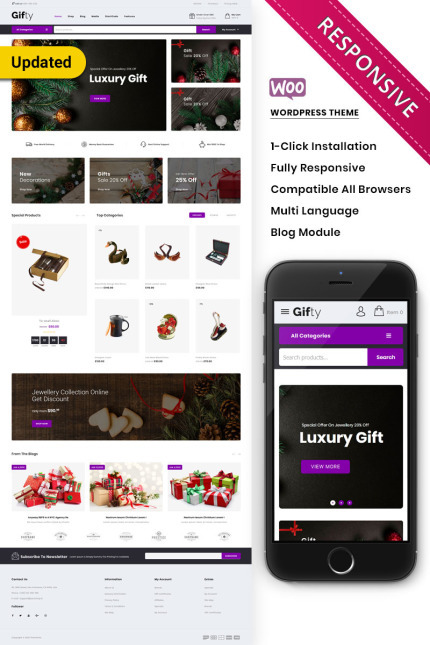 Gifty Woocommerce Responsive Template is a highly versatile platform to make a unique and eye-catching website for your gift stores or souvenir gift shop. This theme has a fast and user-friendly options panel that permits you to customize and style your theme colors, fonts, change background and unique layouts. Entirely, Gifty has a visually stunning layout with all the simple-to-follow and interaction appearance.Moreover you can use this template for electronics, computers, fashion, furniture, accessories, food, apparel, cloths, kitchen, jewelry, tools, medicine, mega, minimal and multipurpose stores.